One exciting step of quilt progress around here is that I picked up fabrics for three of my Scrappy Trip Bee members. I snapped some quick shots of the fabrics tonight and emailed them out for approval. I wavered back and forth about whether to surprise my fellow bee mates (or honeycomb members), but in the end, I decided I’d rather make sure they are getting a block that works for them. Our comb leader emailed me a picture of the completed block that she made for me, and I’m excited that it should arrive in the mail soon. Since I already got the thumbs up on one of the three emails sent, I can cut into the stack of fabrics pictured above and get to work on that block. I’m keeping my fingers crossed that I get in some quilting over Thanksgiving break. The next exciting event was that Justine, my first quilting student, came over to start cutting her quilt fabric. Here she is hard at work; I promise I’ll show her face eventually, she’s not in witness protection of anything 🙂 I just wanted to grab a quick action shot. So, what did we learn? Well, I learned that I’ve been quilting just long enough now to take skills for granted. I’d forgotten just how hard it is to keep a rotary cutter snug against a ruler until Justine veered too far off the path for us to be able to use her first strip. Oops. Note to the beginning teacher. Have some practice fabric handy. Justine caught on quickly though and then did a great job working her way towards some independent cutting. Her first lesson was that cutting out pieces for a quilt can be a slow, arduous, and somewhat boring process. Sigh. Can I get an amen? Since we’re working on a pattern labeled intermediate, there are quite a few pieces involved. I decided that I would help with some of the cutting too. Since my large mat and 24 inch ruler were in use, I tried in earnest to use my new-used Alto cutting system that I snagged on Craigslist for $35 a month or two ago. I think this is the first version of it that is no longer sold, but when I saw that the new version sells for $230, I was pretty excited to snag this one. Perhaps there are differences in the design that I can’t see in pictures, but overall they look the same except for that added ridge on the clear slide. Removing it on the new version was a good design call because I had to go get a new Olfa rotary cutter when I discovered that my Fiskars one was too bulky to glide next to the ruler. How am I liking the cutting system so far after my initial bargain hunter excitement? Well, to be honest, I’m a little underwhelmed. It seems like I have to be careful how I hold the slide down, or it scoots a bit off the mark, and for now, it’s quicker just to line up my 24 inch ruler on my mat lines. I might just need to adjust to the system though. And, I noticed when I looked at the photos on the website while I was getting the link for this post that I think I’m using the system backwards. I should have the track that the clear slide locks into closest to me, and I had it farther away from me. Maybe I ought to do something wild like…I don’t know…watch the instructional video before I pass a final judgement. At any rate, it was good to have a second large mat and cutting straight edge, so the $35 was not a wash. I do like the feature that locks the fabric into place even if I probably wouldn’t use it for shorter pieces. I was cutting into a 3 yard stretch of fabric, so it was nice not to have the weight of the extra fabric that I wasn’t dealing with messing with the alignment of the fabric on the mat. And, the whole unit base is a really sturdy board; I get frustrated if I’m trying to watch TV at my parents’ house and using their flimsy card table as a work station. It doesn’t provide a firm base for a cutting mat, so the rotary blade skips sections of fabric at times. I’m thinking if I plopped this on the card table that I’d have a sturdy work surface and would still be able to stay in the same space as my family. And, finally, get ready for a blog hop party giveaway that is sure to spread a little happiness and fabric goodness before Thanksgiving. 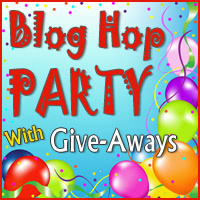 I’ll be hosting a giveaway here, so make sure you check back on November 21st, and if you’re a blogger who wants to spread a little giveaway cheer, you can still register your blog for the party. Ok, that’s about it for the night. I should be going to bed, but I think I might at least iron a bit of the fabric that I need to cut for my Christmas gift quilting project. Spending a few minutes here and there on it will save me from a Christmas Eve rush to the finish. This entry was posted in quilting and tagged quilt, quilt teacher, Scrappy Trip Bee. Bookmark the permalink. Love the bee block fabrics, great cours and designs. I am doing the giveaway hop too! So many giveaways, exciting:) I have that fabric that looks like a peacock feather(to me..) teal and yellow. I have no idea what to do with it, but it was so mesmerizing in the store!